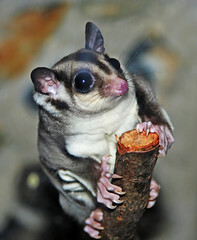 The sugar glider is native to northern and eastern Australia, New Guinea, and surrounding islands. This arboreal, nocturnal creature spends its days in leaf-lined nests in tree hollows. They are extremely social and vocal and can be found in any forest where there is a suitable food supply, but most are commonly found in forests with eucalyptus trees. Being nocturnal, they sleep in their nests during the day and are active at night. During the night they hunt insects and small vertebrates, and feed on the sweet sap of certain species of eucalyptus, acacia and gum trees. They are arboreal, spending most of their lives in trees. When suitable habitats are present, sugar gliders can be seen 1 per 1,000 square metres, provided there are tree hollows available for shelter. As sugar glider veterinarians we are familiar with their care and medicine. Finding a vet that is experienced with sugar gliders is important since their physiology dictates some special health care needs. You need a veterinarian that is knowledgeable about general care, medical care, and surgical care of sugar gliders. Where can you get sugar gliders? We recommend against purchasing sugar gliders at the mall, flea markets, etc. 3 Pings/Trackbacks for "Sugar Glider Veterinarian"